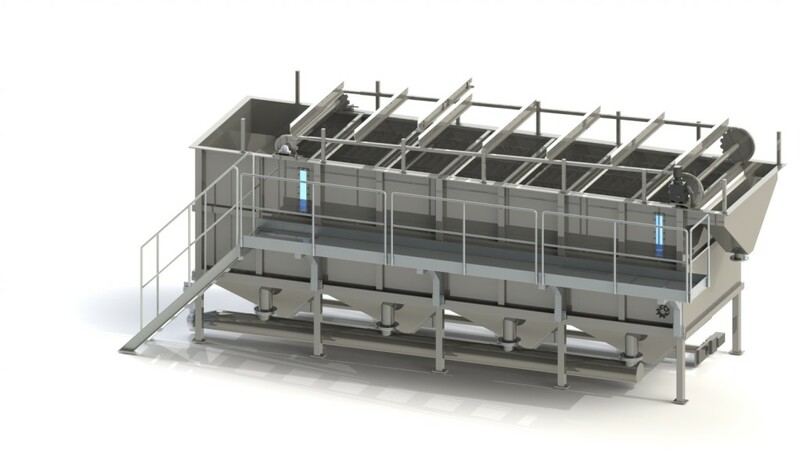 The Quadraflot is an equipment that, by using the dissolved air flotation technology, is providing the solid – liquid separation. The floatation tank is rectangular shaped, very compact to be suitable for installation in narrow and limited spaces. Before entering the flotation tank, the pressurised water produced by the pressurization unit is passing through a suitable valve to reduce the pressure at atmospheric value. In this phase a huge amount of microbubbles get free from the water and once inside the tank they are lifting up the suspended solids to the surface. The clarification of the water takes places thanks the technology of the fluids passing through the inclined lamella system, that allows to increase considerably the flotation surface and consequently to reduce the space required for the installation of the unit. The floated sludge is extracted by a scraping system. The water level is controlled by an automatic control system. Possible sediments are collected in a sump and from there discharged by a timed pneumatic valve. The flotation process mode may be on partial or full flow of the raw water or recycling flow pressurisation of the clarified water. The Quadraflot is a simple and easy unit to be operated, resulting in a system showing high efficiency in a limited installation area. Application Sectors: Paper and Board Industry, Oil Refinery, Mining Industry, Chemical and Pharmaceutical Industry, Textile Industry and Tanneries, Food and Beverage Industry, Industrial Laundry, Municipal and Industrial Water Treatment Plant, Winery, Dairies, Abattoir, Fish Industry, Potable Water Plant.